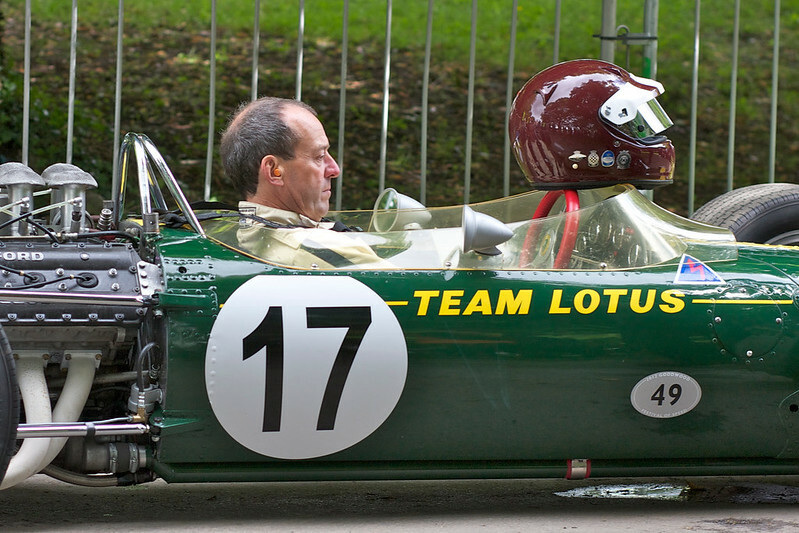 Given at least one person has died on the Goodwood hill, driving a Lotus 63, any idea that the FoS should entertain some more competitive runners must be a non starter unless Lord March wants to change the character, and attendance of the event completely. Sadly, there was also a fatality at the first FoS in 1993 when Vincent rider Chas Guy crashed after the finish line. I understand that that was the reason why, subsequently, all motorcycle runs were untimed. Also not forgetting Andrew Carpenter, the marshal who died in the Dawson-Damer crash. Perhaps the possibility might be worth considering that Goodwood pushes its luck quite far enough already without the presence of competitively-driven specialists further fueled by the biggest crowd before which they are ever likely to perform...? It's a fair point regarding competitively-driven cars, though I doubt the BHC frontrunners would be much fazed by the adoring crowds. It's also valid that excessive speed (and competitiveness) could threaten the things that make the FoS the great event that it is. I consider myself duly (and appropriately) chastened. It was live in front of my eyes. I somehow blundered into the little stand at the top of Paddock Bend & sat amongst all the famous drivers/owners friends & relations. As a Lotus fan at the time, it was at first exhilarating to see the 3 Lotus cars battling with Amon's Ferrari. Then disappointment as Hill dropped out. Then pleasure at seeing Oliver have the race in hand. Then disappointment again as he pulled off the track after Bottom Bend. Then worry that Siffert may be passed by Amon. Then great pleasure that a good guy drove well and took a good win. A bit sorry for Amon too, who drove impeccably but there was just not enough in the car to really attack. Unfortunately though, I later saw Siffert's last race too. I'm not sure how Justin Law, Rod Millen and Anthony Reid can be classed as gifted amateurs!! There is certainly a respected competitiveness between all the drivers, from the modern vehicles down to the vintage cars too. As an aside, do people really think that the F1 guys would risk going for a quick time? They are generally "bitza" cars, not set up to do a hill and one little mistake could cause a whole lot of damage to themselves and crowd and what would the crowd actually get to see other than an F1 car for 0.2 of a second as it flew past. I knew as soon as I saw that posted that it was going to upset someone. What I really meant was "not the big (ie. effwun) names", but I know you're going to moan about that as well. Does anybody know who drove/ownes the Shadow Mk.III that was there? I also would be very happy if somebody could post some pictures of the car. Some more on this link. Edited by Wouter Melissen, 19 July 2012 - 08:29. 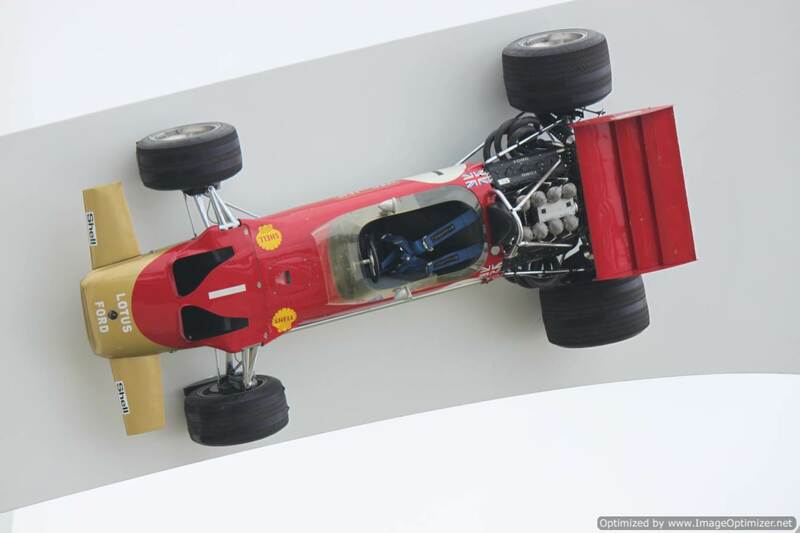 Awesome images, Wouter, saw Jackie and Carlos pace run the Mk IIIs in the day. A bit late in the day I grant you for the FoS thread, but I have been away, and I have not scrolled through every photo file for the event, but here is something for Barry Boor. Copyright Roger Lund, all rights reserved. I still have my one of those. For what it's worth, the fastest run I've ever seen was McNish in the Toyota a few years ago; really left his imagination in the paddock and went for it big time. I heard a rumour it was sub-41secs on unofficial timing. Wondering if anybody knows which 49C featured on the art work, I understand the 49C driven by Johannes Willenpart and Emerson Fittipaldi during the FoS was the second incarnation of R6 which Rindt used to win at Monaco in '69 ? Answers maybe credited and used in a forthcoming blog. Thanking you in anticipation of your responses. 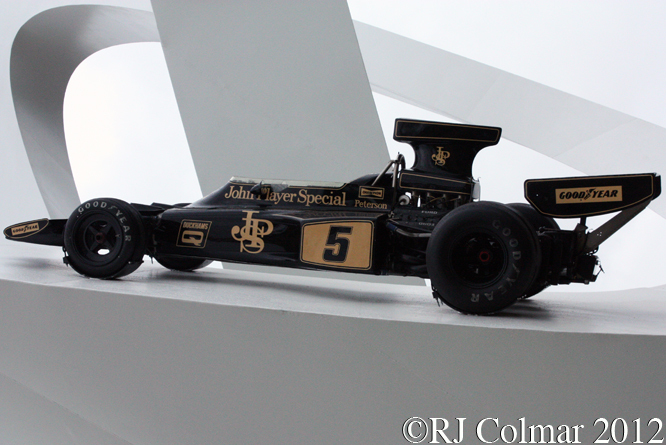 I have heard from a usually reliable source that FOS 2013 will celebrate 50 years of McLaren. 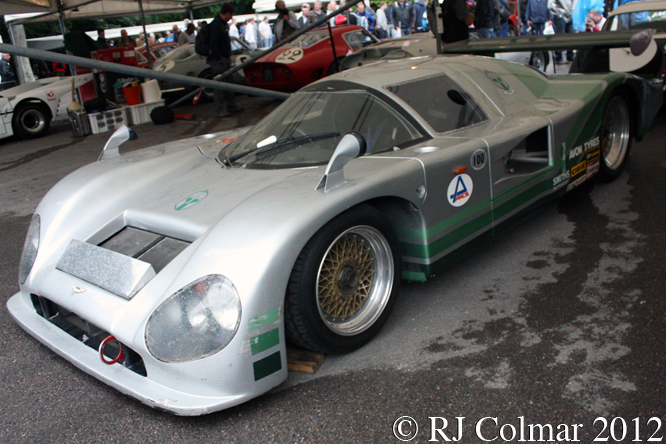 R10 the Clive Chapman car? 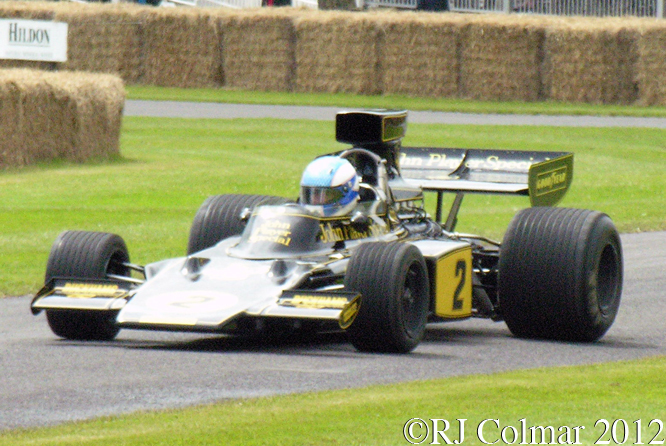 Meantime I'll be blogging about the 72E's that appeared at Goodwood FoS in a couple of weeks time. I think Clive has R5 & R9 which should account for at least one of them. As the happy owner of one example of the late Adolf's favourite mode of transport, a copy of the Mercedes Benz magazine plops through my letterbox several times each year, and it's a very good example of this kind of thing, the last one had an interesting discussion on "The greatest-ever British Racing Driver", Sir Stirling won of course, closely followed by Jim Clark. The current issue has an interesting piece on the FoS, but wanting more information on something featured, I went to the MB UK website to check. This is their web address. I watched the offical 2012 FoS DVD the other day - it's just the ITV4 show with some extras (so they included my skid!!). In the unlikely event that anyone is interested, they asked six people for their opinions, Ross Brawn, Murray Walker, Jody Scheckter, the dreaded Andrew Frankel, and two others for their opinions, and scored their choices as the old WDC scorings, 10 for first, 8 for second etc. Sir Stirling came first with 53 points, Jim came next with 49, Jackie Stewart was third with 29, and Lewis Hamilton and James Hunt got 6 each. Surprisingly, John Surtees, although he was mentioned by Frankel, didn't get a single point, but then, maybe he doesn't currently drive a Mercedes. Both Nigel Mansell and Graham Hill got a mention, but nothing more than that, though against the top three I suppose that isn't so surprising. Any poll like this shouldn't be taken very seriously of course, I don't want to start another thread like those on the recent McLaren and BBC exercises. Me neither. But I don't think Hamilton or Mansell fans are particularly evident here. And Segrave, Birkin, Seaman etc competed in such a different era. Did Fangio ever say publicly how he rated Peter Collins as a driver? Edited by D-Type, 19 October 2012 - 19:14. Did anyone else see the Channel 4 programme last week in the series 'The Aristocrats', about Lord March? It was filmed throughout 2011 and up to and including the 2012 Fos/Revival Press Day, and there were some revealing glimpses - it's still available to view in the UK on 4oD for 25 days. With Lord March doing so much with the estate, I wondered what his father, the Duke of Richmond and Gordon, does? Apparently he handed over control on Lord March's 40th birthday in 1995, when the Duke was 66........so enjoying a sort of retirement, I suppose. Will LM do the same in 2034 when his oldest son reaches 40 (assuming primogeniture is still male; otherwise it would be in 2025) - LM will be 79 then. The TV programme showed LM returning to his previous career with an exhibition of photography; perhaps that's where his heart lies. At one point during coverage of the year 2011 it was mentioned that a new venture in 2010 had lost £1million; I wonder what? And at the 2011 FoS just before the big Indy 500 parade there was some sort of crisis involving Emerson Fittipaldi, and the cameras were turned off; anybody any idea what that was about? Now that the German Grand Prix clashes with the Festival I wonder what sort of F1 presence will be there. In some ways it will be refreshing to have a Festival without crowds of F1 groupies trying to mob the drivers. It's clearly a big draw for a lot of the (probably younger) people there, but each to their own. It's the only area of exhibits I rarely go near, and as burn-outs and doughnuts have very little appeal, I won't miss the modern F1s on track either, but again each to their own, it's certainly a part of the display that gets all the kids screaming. Like Kayemod I don't agree with this - it'll be a distinct improvement without the modern F1 boys farting about. They also seem to take up more and more space in the top paddock every year. I don't suppose that Lord March is too pleased, though. Is the FoS date firm or might it move ? I think it has been moved several times to fit in with the F1 timetable? As a casual observer of F1 for a long time, I give the gong for the most gentlemanly driver to Stirling, most outlandish Hunt, bravest Mansell, Biggest whinger Nigel!, best tryer Damon and best safety expert to JYS. Most trendy Lewis and a honorable mention to Jensen as a smooth operator who was not overshadowed by Lewis! ...a honorable mention to Jensen as a smooth operator who was not overshadowed by Lewis! Jensen has better taste in tattoos as well, a miniscule button on one arm. If you think the recent scrawls on Lewis' arms are bad, you should see what he's got all over his back... But maybe on-off woman friend Nicole Shirtlifter likes them. It's just current fashion with Lewis' generation, but I do feel at some stage in his life, he's going to fell a right berk (as are many others of his generation). In my youth, tattoos were the domain of ex-Merchant & RN seamen & Romanys and were generally considered to be rather vulgar. I wonder how many racing drivers from past eras sported or concealed tattoos? There will have been some about, the photographer Patrick Litchfield, cousin of the Queen was covered in them for example. Edited by Giraffe, 06 December 2012 - 09:50. True, and it's only a short step from there to a Prince Albert, perhaps the unkindest cut of all. I finally caught Speed's broadcast and have officially added the FoS to my bucket list. The roar from the Ferrari 712 gave me goose bumps, can't imagine how it must have sounded from 50 feet away. Hard luck, gents, the F.1 people WILL be there in 2013. Goodwood are changing the date of the F.o.S. Due to the FIA unexpectedly announcing a further change to the 2013 F1 calendar, Goodwood will now have to change the Festival’s date in order to avoid this conflict with the amended Grand Prix. Wondering if anyone knows which Nimrod Aston Martin belongs to the Louwman Museum ? Tony Brooks in the Syracuse Connaught. I'd hoped to tell him how much I enjoyed "Poetry In Motion" but was outflanked by autograph hunters. I believe seven B Types were built, does any one know which of the seven Tony drove to victory in Syracuse ? This is corroborated in the relevant F1R 'Black Book'.